New York Representative Alexandria Ocasio-Cortez put her money where her mouth is on Thursday, February 7, with the release of a Green New Deal alongside Democratic Senator Ed Markey. The resolution seeks to convert 100 percent of the nation's electricity to clean sources within the next 10 years, and was a marquee campaign issue for the freshman congresswoman. And while the Green New Deal isn't on its way to being a bill just yet, its lofty goals for the future of America might result in some actual changes as to how we manage the environment. The resolution cites a sobering 2018 UN climate study in its preamble, and argues in no uncertain terms that climate change is real and caused by human interventions, and that its effects on our economy, jobs, and lives depend on fixing our mistakes. The extensive 2018 report argued that the state of climate change is such that human beings have reached a last-chance opportunity to make change before damage to the planet becomes irreversible. President Trump, unfortunately, has previously stated his belief that climate change is not real and even pulled the US out of the Paris Climate Agreement in 2017. His 2019 State of the Union address did not touch on climate at all. But with the House of Representatives having flipped back to the Democrats, and less than two years before another major election, Ocasio-Cortez's Green New Deal could eventually become the legislation that helps change our future. gas emissions, having emitted 20 percent of global greenhouse gas emissions through 2014, and has a high technological capacity, the United States must take a leading role in reducing emissions through economic transformation," the resolution reads, in part, before launching into five goals, suggestions on 14 government-funded projects, and 15 requirements to execute the deal. Among the five goals that the Democratic team hopes to achieve is a reduction of carbon emissions alongside the creation of new, clean-energy jobs. The document also reflects a holistic model of climate sustainability that reflects the relatedness of food systems, broad-scale employment availability, and health care access. It cites a mission to "[work] collaboratively with farmers and ranchers" to institute "sustainable farming and land use practices that increase soil health" and support family farms. Of course, the goals outlined in the Green New Deal are extremely ambitious, but they're meant to be. Decarbonizing electricity, transportation, and industry, restoring natural ecosystems, and upgrading buildings and electricity grids within a 10-year timeframe might be a tall order, but putting the pins in place to bring the country closer to such massive overhaul is much better than doing nothing at all. Perhaps unsurprisingly, there's already been pushback by the GOP, even before the deal was released. "We should be open to the fact that wealth transfer schemes suggested in the radical policies like the Green New Deal may not be the best path," Rep. John Shimkus (R-Ill.) told the House Committee on Energy and Commerce on Wednesday, also arguing that a top-down, government-managed plan to decarbonize the US isn't "realistic." Republican officials have generally tended to profess that climate change is either not real or a subject of partisan exaggeration. But voters, in general, are interested in the greening of America. In December, Yale released the results of a report suggesting that a majority of both Democrats and Republicans wanted a Green New Deal - even before any report was released. "Given that most Americans have strong support for the components and ideas of the Green New Deal, it becomes a communication strategy problem," Abel Gustafson, a postdoctoral associate who co-authored a report on the findings, told the Huffington Post. "From here, it's about how you can pitch it so you can maintain that bipartisan support throughout the rest of the process." The report found that 81 percent of respondents were in favor of new green initiatives, but 82 percent of people surveyed had no idea about the Green New Deal as of late last fall. Although the resolution doesn't outline how its projects will be paid for, the authors suggest that funding dilemmas are beside the point. 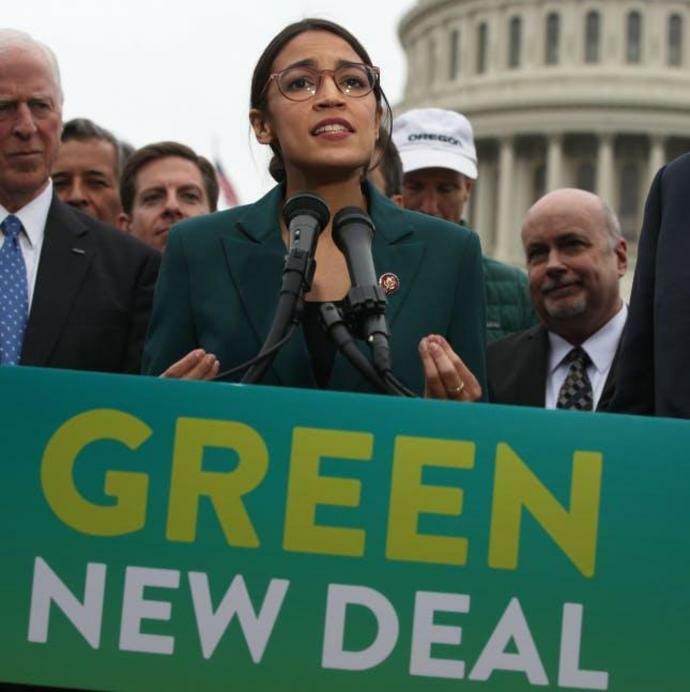 "The question isn't how will we pay for it, but what is the cost of inaction, and what will we do with our new shared prosperity created by the investments in the Green New Deal," reads the fact sheet distributed to Congress along with the resolution. "Even the solutions that we have considered big and bold are nowhere near the scale of the actual problem that climate change presents to us to our country, to the world," Ocasio-Cortez told NPR News on Thursday morning. "So really, the heart of the Green New Deal is about social justice and it's about allowing and fighting for things like fully-funded pensions for coal miners in West Virginia, fighting for clean water in Flint, and fighting for the ability of Indigenous peoples to take a leadership role in in where we're moving as a country."